Consider living in an RV, if the thought of being tied down to one particular location does not appeal to you. We have seven years of experience in this wonderful and inexpensive lifestyle. Perhaps living aboard a sailboat is not your cup of tea, I have never heard of anyone getting seasick on an RV. The RV lifestyle is something you can enjoy into your 80s... And still have a lot of fun. Living on a sailboat had convinced us that living in small spaces was very doable and enjoyable. We felt that RV life would be very similar... Except that we would have a lot more room in an RV. We discovered that living in an RV was also another very inexpensive lifestyle, and would be a great way to spend the summer, seeing the US... 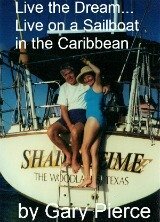 While we hauled our boat out of the water for hurricane season in the Caribbean. 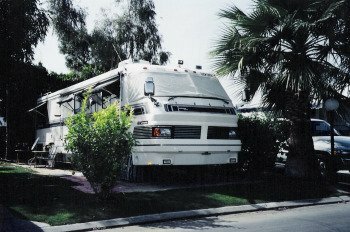 Here is a picture of our 40 foot 1992 Foretravel That we purchased used, with 99,000 miles on the odometer, in May 1998. As an update we purchased another 1992 Foretravel Silver Anniversary in 2015...it had 153,000 miles...lest you think me crazy...the engine was overhauled at 138,000 miles...we have put around 10,000 miles on it and it purrs like a kitten...so do not let high mileage scare you when looking at RVs. Living in an rv, why did we pick a 40 footer? Once we decided that we wanted an RV for our time off the boat we searched from Oregon to Florida, looking for the perfect model. Having lived, quite comfortably, in a 35 foot sailboat we thought that a smaller RV would be adequate for our needs... And it would've been. Why did we pick a used RV with 99,000 or 153,000 miles? Some people might think that buying an RV with that many miles on it is not prudent... Trust me we did our homework first. As anyone that has traveled the freeways of America you run into a lot of 18 wheelers which are driven by diesel engines... They can last several hundred thousand miles before needing an overhaul, so do not let high mileage on a diesel powered RV scare you off... If the interior and exterior are what you want go for it. An RV powered by diesel engine is called a pusher since the engine is in the rear, putting more weight on the rear wheels. And RV with the gas engine, has the engine underneath the front wheels... The gas powered RV will have better acceleration and better gas mileage than the diesel. The diesel shines in torque and longevity. Living in an RV was a heck of a lot of fun and inexpensive it should be on your frugal retirement living radar.